Hello and welcome to Gladfest 2016! The UK’s friendliest festival is back for the fourth year with another programme carefully curated to bring you the world’s best and brightest writing talents. From old friends returning with their latest books to new-to-Gladfest stars, you’re sure to find events that will inspire you to think a little differently. Big names for the Gladfest lineup this year include Val McDermid (Splinter the Silence), Scarlett Thomas (The Seed Collectors), Michel Faber (Undying), Loyd Grossman (Benjamin West and the Struggle to be Modern), Richard Holloway (A Little History of Religion), Sarah Perry (The Essex Serpent) and more! Visit our Gladfest Speakers pages for the full list! Listen to literary talks in our beautiful Grade I listed Reading Rooms, mingle with like-minded festival-goers or share a drink with our authors by the fire. At Gladfest there’s no backstage and no green room so you never know who you’ll sit next to! Know any younger Gladfesters? There’s a whole new Young People’s Tent and a series of Roald Dahl-inspired activities just for them. Roald Dahl would have celebrated his 100th birthday this year. Happy Birthday, Roald! PLUS, with our newly-expanded Gladfest Market Place packed full of local designers and contemporary crafts, Gladbooks bookstall stocking reads from all of our writers (get them signed in the Chapel too! ), the Food for Thought servery open throughout the day for delicious homemade hot and cold food and the Gladbar ready and waiting to serve up your tipple of choice, there’s more going on than ever before…so you can stick around, make new friends, and make a day of it at Gladfest 2016! Visit our Gladfest Speakers pages for the full programme. 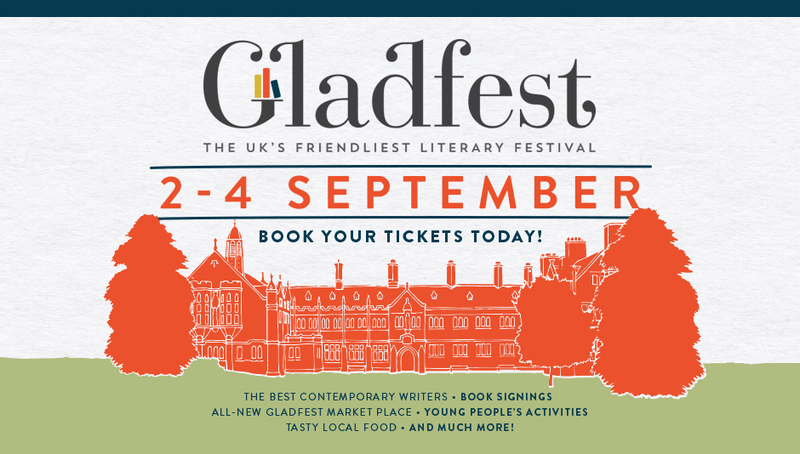 Download the official Gladfest 2016 programme here.